CHICAGO – Exclusive! Free festival 7-packs! In the latest HollywoodChicago.com Hookup: Film, we have 50 pairs of guaranteed festival 7-packs up for grabs to the fourth-annual 2016 Chicago Critics Film Festival at the Music Box Theatre from the Chicago Film Critics Association! Michael Peña and other stars will be in attendance at Q&As! The festival runs from Friday, May 20, 2016 to Thursday, May 26, 2016 at the Music Box Theatre. Created by the Chicago Film Critics Association in 2013, the CCFF offers a selection of films comprised of recent festival favorites. It also features as-yet-undistributed works from a wide variety of filmmakers ranging from award winners to talented newcomers chosen by members of the organization. The CCFF is the only current example of a major film critics group hosting its own festival. It brings together an eclectic array of films ranging from raucous comedies and foreign-made dramas to thought-provoking documentaries, midnight genre films and shorts programs. The full 2016 Chicago Critics Film Festival schedule can be found here. Each HollywoodChicago.com winner will win a pair of festival 7-packs of guaranteed tickets to experience the following Chicago premieres at the times and dates below – one each day for the duration of the festival! The Chicago Critics Film Festival is curated entirely by professional Chicago film critics. HollywoodChicago.com is written by Chicago Film Critics Association-accredited critics. To win your free Chicago Critics Film Festival 7-pack courtesy of HollywoodChicago.com, just get interactive with our social media widget below. That’s it! 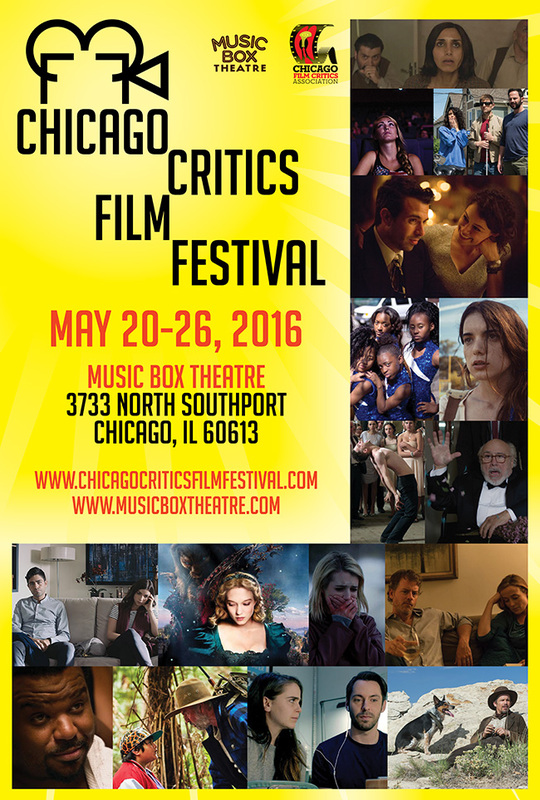 These festival premieres take place one a day from Friday, May 20, 2016 through Thursday, May 26, 2016 at the Music Box Theatre at 3733 N. Southport Ave. in Chicago. The more social actions you complete, the more points you score and the higher yours odds of winning! Completing these social actions only increases your odds of winning; this doesn’t intensify your competition! Deadline: Entries can continue being submitted through Tuesday, May 17, 2016 at 5 p.m. CST. These Hookup winners will be awarded via e-mail that night. The 2016 Chicago Critics Film Festival. Directed by Chad Hartigan (whose previous feature, “This is Martin Bonner,” was part of the first Chicago Critics Film Festival), this crowd-pleasing comedy follows the adolescent misadventures of a 13-year-old American boy (Markees Christmas) growing up in Germany while living with his father (Craig Robinson). This film was a hit at this year’s Sundance Film Festival where it won the Waldo Salt Screenwriting Award and a Special Jury Award for Individual Performance for Robinson. “The Send-Off,” “Pombo Loves You,” “Killer,” “Figure,” “Heila Ormur” and “Love Bite”. In the summer of 2015, legendary musician David Byrne staged an event at Brooklyn’s Barclays Center to celebrate the art of color guard: synchronized dance routines involving flags, rifles and sabers. Recruiting performers that include the likes of St. Vincent, Nelly Furtado, Ad-Rock and Ira Glass to collaborate on original pieces with 10 color guard teams from across the U.S. and Canada, “Contemporary Color” is a beautifully filmed snapshot of a one-of-a-kind live event. A mysterious stranger and a random act of violence drags a town of misfits and nitwits into the bloody crosshairs of revenge. Seventeen-year-old Anne just fell in love with Sasha, the most popular girl at her Los Angeles public high school. But when Anne tells her best friend Clifton – who has always harbored a secret crush – he does his best to get in the way. This HollywoodChicago.com Hookup is simple! Just get interactive in our social media widget above. We will award 50 pairs of festival 7-packs based on social entry numbers and/or randomly via e-mail for our 2016 Chicago Critics Film Festival Hookup. Good luck! Our winners must print our e-mail award and bring it to the Music Box Theatre. The e-mail award authorizes our winners to redeem free will-call tickets for the showings listed above.